Tag Archives for " su.pr "
Maybe the term StumbleUpon is new to you, maybe you find it fascinating, or maybe you realize what an important traffic tool it is, either way, it’s time to dig in and learn a little more. StumbleUpon is a bit of an oddity in the world of online marketing, used by some to discover new things and by others to generate traffic. I use it for both and find that with a systematic approach it can become an important source of traffic. Now, traffic for traffic sake isn’t always the best pursuit. Quality traffic, the kind that is interested in what you sell, wants to contribute to your community and subscribe to your newsletter, is the real goal of online traffic generation, and StumbleUpon traffic is generally a mixed bag in that regard, but with very little effort you may find some of that ideal traffic coming by way of a StumbleUpon strategy. I often liken orchestrating traffic generation to dance steps, so here’s my five step approach to mastering the StumbleUpon Tango. The first step of course is to create a StumbleUpon account, but to actually use the tool in the manner I suggest you should also install the StumbleUpon browser toolbar to make it easier to find, share and communicate with the community. StumbleUpon will show you content when you stumble based upon the interests you list in your settings. If you want to use this tool to discover Web content to share for business purposes take care when selecting these interests. There are many ways to network and use StumbleUpon in a social manner and connecting with people who share your interests is a good idea. You may also want to add your contacts or connect via Facebook to see if any of your current contacts and friends are using StumbleUpon. The first rule of StumbleUpon is to give – share and review other’s people content and you may find the same happening to your content. Another obvious integration of your StumbleUpon efforts comes in the form of a button or badge for content on your Web pages and blog posts. Just as many have installed the Facebook Like, LinkedIn Share and Google+ buttons to their content pages, StumbleUpon has a button that makes one click sharing of your content on StumbleUpon a snap. StumbleUpon has its own link shortener called su.pr. This tool makes it very easy to submit your content to StumbleUpon at the same time you submit it to Twitter and/or Facebook. You will also get some nice tracking stats from using the tool. StumbleUpon sells traffic and while the quality tends to suffer, it can be a low cost way to send a surge of traffic to a specific blog post or campaign. You have the ability to target the traffic by interest as well. 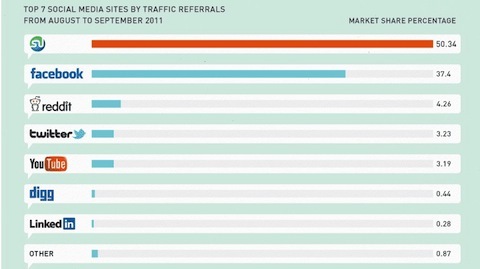 For a little more on the benefits of using StumbleUpon you might enjoy this infographic put out by them. One of the major push backs I get surrounding twitter use for business involves the idea of ROI. It’s a genuine concern and something that can feel very hard to measure for most businesses. It’s rare when someone can effectively attract followers and blatantly sell something to that at the same time. In most social media settings it just doesn’t work that way. The objective is to simply create enough engagement that people want to find out more on their own. While that’s a great long term objective, it can be a little hard to track. One of the approaches I preach is to think about you tweeting activities, and subsequent payoffs, in an expanded way. Sure, you want to get more business, but I find that getting better ideas, testing messages and doing all manner of research with my tweets provides tangible ROI for my business as well. A large percentage of my tweets are positioned to intentionally test ideas and trends for use in other ways. I’m still providing engaging information, but in a strategic way – that’s how you need to think about your activity in any social media setting to get immediate and long term ROI.